Welcome to the Epic Stock Picks Trading School! from years of trading the markets. There is no hard and fast rule or strategy to successfully trading stocks. do their own research and due diligence and consult with a licensed financial professional before investing. You’ll need a broker. While the days of calling your broker are not quite over, nowadays most traders use online brokerage services. There are a ton online that you should research which have the quickest execution and the cheapest commission fees. Broker aside, No Investor should be trading Penny Stocks without a FULL trading platform from your broker or elsewhere. This includes full charting capabilities, instant execution, and most importantly, real-time Level II Quotes. What are Level II Quotes? In its simplest explanation, Level II is basically the market depth of each stock, ie: how many sellers are on the ask and how many buyers are on the bid, and the prices at which they are bidding and selling at. I can not stress how important it is to trade with Level II quotes. This is a must-have for any serious trader. Combined with a side panel of the stocks current “Times & Sales”, Level II Quotes can truly make a difference. We will discuss how to disseminate Level II set ups later. There are a number of places that offer Level II Quotes. You can actually get them from your online broker: the largest brokers such as E-Trade, TD Ameritrade, and Scottrade all have excellent trading platforms which include Level II, however, most require upwards of $20,000 in your account to use these platforms. If you do not have this type of liquidity, we recommend using Equity Feed or Alpha Trade for real time quotes as compliment to your basic trading account for Level II quotes. Equity Feed is quite costly, but if set up right, it can be the most powerful tool you will have. Additionally, EquityFeed has a news streamer to keep you on top of any news that may create some momentous activity for the price per share. Trading penny stocks can be quite different than trading stocks that are over $1.00. Many times a single trade can drastically influence the movement of a stock and shareholder sentiments on top of that. Since pennies are so volatile, it’s easy to scare off investors with a big sell, or encourage them with a big buy. That’s why the key is Liquidity. What causes a Penny Stock to rise? The most crucial catalysts are usually News via Press Releases, hype, promotions, and newsletters. It is important to understand that this market is also full of insiders who manipulate stock prices, short sellers, and companies who dilute their own stock by increasing the share count. It is impossible to know how a penny stock will trade with these factors. A penny stock may start to run and before you know it, an insider may dump or the company may dilute and that run will effectively be over. The best defense is to always research the company, their share structure, and their history to know which stocks to stay away from. To Day Trade or not to Day Trade? Sometimes penny stocks are only worth holding for a day or even a few minutes! It all depends on the liquidity. If a stock is trading with great liquidity and is moving fast, your best bet could be to take profit right away. Do not worry yourself about missing a few extra gains – in the long run, if you make it a habit of securing profits when you can, you may see your portfolio grow exponentially. Some traders wait for the BIG money trade in which they book a 200-500% gain all the while they are losing on other stocks where they missed the opportunity to grab a 20-30% gain. The trick is not to be greedy. It is important to note that even the best traders lose money 70% of the time when trading. How is it possible to make money trading penny stocks you ask? A seasoned trader will tell you that you must know when to cut your losses. Timing is everything in this market. Using Stops is one way to cut your losses by placing a sell order at the lowest price you are willing to take a loss. Remember, if you take a small loss on one stock, there is ALWAYS another opportunity to profit right around the corner from another! We are going to assume you understand how to read charts and are somewhat familiar with candlestick formations and other indicators. If not, please do more research as there are various resources for the novice trader on the web. 50 MA (Moving Average): A break of this line could signify a confirmed Bullish Breakout. We also look for stocks that already trade above it which may indicate there is less of an upward resistance barrier. 200 MA (Moving Average): Break of this barrier may confirm a bull run but also may signify that the run may be over and act as a resistance barrier leading to retracement or consolidation. MACD: A cross of the MACD Line and Signal is a good indicator that the trend is going into positive divergence which may lead to a bullish breakout. If the line crosses over the 0.0 region, bullish divergence is usually confirmed. RSI: Generally we like to see this on an upward slope around the 50 area. Between 50-70 is usually what we refer to as the “Power Zone”. Above 70, a stock usually considered “Overbought”, however, RSI can still continue up with the PPS as there is no hard and fast rule to sell at that level. Bollinger Band Squeeze – when the two bollinger lines converge, this is usually an indicator of a squeeze where the chart may break out of consolidation. Notice how once the selling volume depleted, we entered into a consolidation zone and hit the bottom support levels. 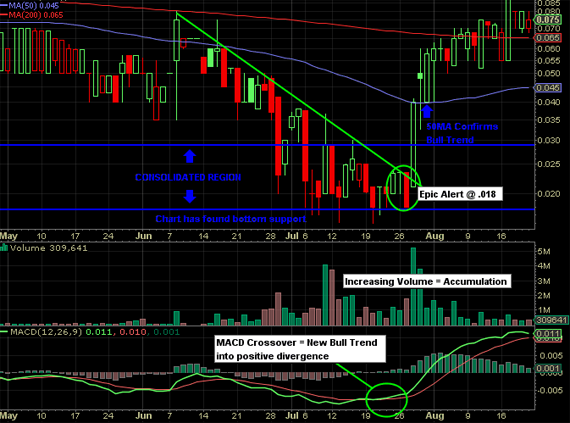 As volume began to increase, we saw a MACD crossover and a break of our trend line. Once the 50 MA was broken, it became support and eventually consolidated around the 200 MA. Notice how after a great exponential move up, the chart sold-off a bit too drastically. 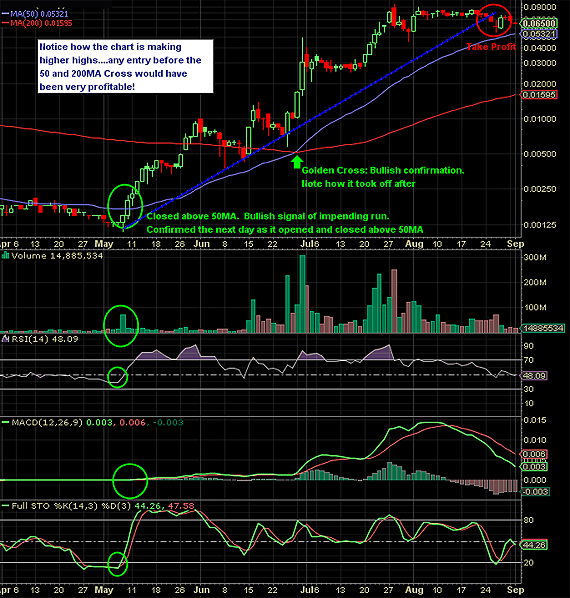 Once the chart bottomed, an expected “bounce” was predicted and that became our entry point. Our trend line from the previous rise was used as a take profit point where, as you see, it began to consolidate again. As mentioned before, we love charts that just break through the 50 MA line. This is one of our favorite indicators. However, the stock must have volume for this indicator to mean anything. It is usually a good signal of an impending bull run. Notice how all indicators aligned for this confirmation (Volume increase, RSI slope upward, MACD crossover, stochastic DI+ & DI- cross). Also notice how many opportunities there were to catch dips as the chart was making Higher Highs. Charts can also be used for intra-day trading as well. If your platform supports live streaming charts, set your time period from 1-15 minutes (depending how you plan to trade) to identify intra-day dips at support levels and resistance points to take profit. 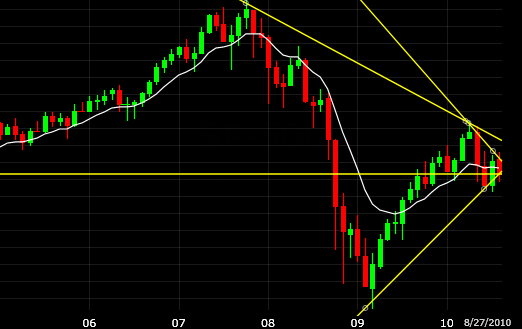 Chart indicators and patterns may not always mean there is an impending bullish breakout. However, coupled with good research and fundamental analysis of the company, you can be one step ahead of the rest. We will cover this in the next lesson. In the penny stock market doing your DD (Due Diligence) can be the difference between making and losing a lot of money. You do not want to buy the wrong stock. We always encourage researching every company you plan to invest in. But what are the key things to look for? Reverse Merger (R/M): The acquisition of a public company by a private company, allowing the private company to bypass the usually lengthy and complex process of going public. This is generally considered a good thing as it increases shareholder value – especially if the private company boasts good financials and revenues. Reverse Split (R/S): A stock split which reduces the number of outstanding shares and increases the per-share price proportionately. This is usually an attempt by a company to disguise a falling stock price, since the actual market capitalization of the stock does not change at all. For example, if a company declares a one-for-ten reverse split, then a person who previously held 20 shares valued by the market at $1 each will then have 2 shares worth $10 each. You will want to stay away from any stock that has recently done an R/S or is preparing to. Market Capitalization: The total dollar market value of all of a company’s outstanding shares. Market capitalization is calculated by multiplying a company’s shares outstanding by the current market price of one share. The investment community uses this figure to determining a company’s size, as opposed to sales or total asset figures. A high market cap can sometimes be looked at as a negative if the company is not valued equally (ie. by comparing revenues etc) and does not have future potential. Outstanding (O/S), Authorized (A/S), Restricted Shares: Stock currently held by investors, including restricted shares owned by the company’s officers and insiders, as well as those held by the public. You will want to stay away from a stock with too many outstanding shares relative to its current price. Restricted shares are shares owned that can not be sold on the open market until a specified date. Float: The total number of shares publicly owned and available for trading. The float is calculated by subtracting restricted shares from outstanding shares. For example, a company may have 10 million outstanding shares, but only seven million are trading on the stock market. Therefore, this company’s float would be seven million. Stocks with smaller floats tend to be more volatile and move quicker than those with larger floats. You will want to look for floats that are not too low and not too large. For a penny stock, the best place to check the current share structure is at http://www.otcmarkets.com. You will want to make sure the company is current and fully reporting (although this does not necessarily make a stock more or less profitable). Many companies are not updated and do not divulge their entire share structure. Lets look at an example: Stock currently trades at .003. There are 3 Billion Outstanding Shares and 2 Billion in the Float (about $3 million dollars). This may not be a good investment as the company is probably in dilution mode and you may not see much upward movement. However, if that same stock at .003 has 100 million outstanding shares and 20 million in the float (about $60,000. ), you can bet that this stock could move quite easily on increased interest and volume. 1. Always use a Limit Order: Most brokers wont even allow you to use Market Orders. Limit Orders allow you to set the price that you want to buy and sell the stock at. This is common knowledge however, you may see some novice trader make the mistake of placing a market order to sell and take out all buyers at the bid, effectively tanking a thin stock. 2. Buy and Sell at the Ask and Bid: Many don’t realize that when you buy at the Ask price, you may be HELPING the stock price to move up! Once that offer is gone from the shares you purchased, Market Makers could move up to the next offer price as they will see there are buyers at the current price. If you decide to place an order at the bid, you are basically hoping someone will sell their shares to you at this price and risk not getting filled and miss the action. It is not always a bad idea to bid sit, as you are creating “bid support”, if you believe the price may come down again and you are not willing to buy higher. 3. CHASING A STOCK – Many people want to buy a stock so badly that they end up chasing the stock as it goes up. When they finally fill their order, they may have purchased it too high as traders who bought shares earlier begin to take profit, effectively lowering the stock price and making you a bagholder. Remember, often a stock could retrace/dip back to an attractive level for you to grab shares. 4. Using Stops: Some brokers do not allow you to use stops, however, if you can – it is always a good idea to set your stop loss at the lowest price you are willing to take a loss. You may kick yourself when the stock moves back up and your stop already executed, but remember, there will always be other opportunities and its always best to cut your losses just in case. 5. Stock Gaps: If a stock gaps up too high in pre-market, you may not want to chase it. Most stocks that gap up may come down again during the day. When a stock gaps up the market makers could push it lower starting at this time to try to get investors to panic and sell shares back to them so they can make a profit on any shares they are short from filling orders on the gap. If you like the stock and it gaps up you can usually pick up cheaper shares if the market settles back. Below are some examples of Level II setups that are attractive and ones you may want to steer clear of. Remember, stocks that have Thin Asks (few market makers at one price) and good bid support (good amount of market makers at the bid) may offer opportunities. Please also note that many OTC and Pink Sheet stocks show only 5000 or 10,000 shares by some market makers on Level II. This simply means that the market maker may have more shares than that amount to buy or sell. In fact, it could mean that the MM has 1 Million shares even though we only see 5000! As you can see, we have very good bid support at .0005 and its looks very thin with only 2 MM’s at .0006 and a few more at higher prices. A .0006 entry could set off a run. If you owned shares at, lets say, .0002 and wanted to sell you could easily unload at the bid of .0005 with all that support or put an offer on the ask at .0006 which may get hit since .0005′s have so many buyers. Note: if you are selling more than 5000 shares, your offer will show up on Level II quotes. Here is an example of a setup that you may want to stay away from. As you can see there are plenty of sellers on the ask but the bid support is really thin. If you owned shares and wanted to sell them on the bid, you may end up tanking this stock as well! Can you guess what may happen here? This is what is called a large spread. The bid is at .0022 and the ask is more than double the bid at .005. If you were to buy at the ask, the stock would be up over 125%! You may want to stay away from any set-ups like this. So whats going to happen here? As you can see bid support is ok at .0125 however it looks like we have some tough resistance on the ask .013. Understanding your Level II quotes is in our opinion the most important tool for trading Penny Stocks. Now that you have learned how to trade…how do you find penny stocks? I will make this last section pretty brief. There are many ways to find penny stocks. There are various Investor Stock Boards to browse through such as investorshub.com and hotstockmarket.com as well as Newsletters. However, many Newsletters, like this one, are compensated for the stocks they profile. The paying party may own shares of this stock and may liquidate them. Please Read the SEC’s Investor Warning. You can also comb through http://www.otcmarkets.com. However, if you are looking for stocks intra-day, your best bet is to get a scanner and set your filters to the parameters you like (ie. stocks that just broke 50MA or have increasing volume, etc). Power E-Trade Pro has an excellent scanner called “Strategy Scanner” and I believe Scottrade and TD Ameritrade have similar. EquityFeed probably has one of the best scanners out there. Congratulations! You have now graduated! I hope these lessons will help further your trading acumen and lead you to great profits and gains! Good luck…and remember, its a jungle out there!